Spain has used the euro since 2002, which it replaced the old peseta. It is the same currency that is used in much of Western Europe. The euro is the only currency accepted in Spain, and it is unlikely you'll be able to use anything else, even in the airport. It may be possible to exchange old Spanish peseta notes in a bank, but the easiest way to get Euros is to use an ATM. Most ATMs in Spain take foreign cards, including VISA, Cirrus, Citibank, and American Express. ATMs in Spain usually offer you the option to be charged in Euros or your home currency. 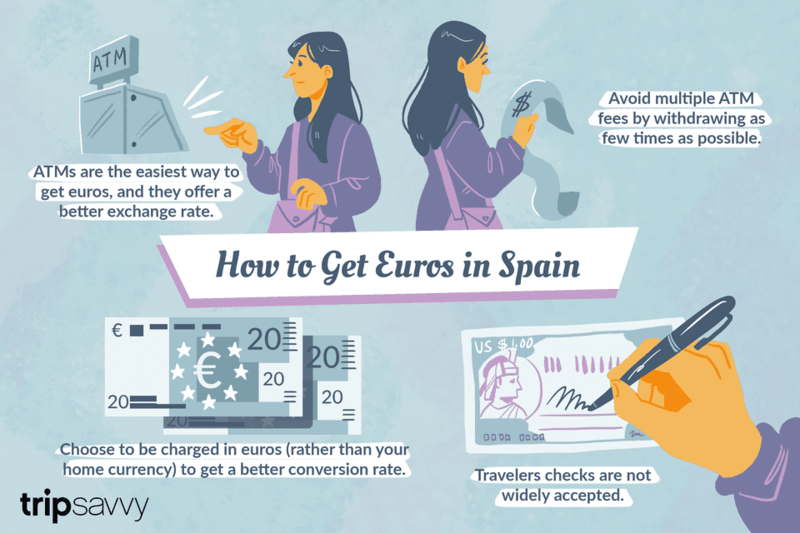 While it sounds tempting to be charged in your home currency, all this means is that the Spanish bank will choose the exchange rate and fees for you, whereas if you choose to be charged in Euros, your home bank will set the fees and exchange rate. The Spanish bank's offer is typically worse than what your home bank will offer, so it's always smart to choose to be billed in Euros. These charges are usually very small (about 2€ or $3), which is around the same amount you would be charged if you were taking the money out of the bank's bureau de change. Unless you are taking very large amounts of money out (say, a couple thousand euros), the commission will usually stay the same, so it is worth taking out as much as you'll need for a few days. ATMs always give you a better exchange rate than a bureau de change; it should be the same as your bank back home, plus a small fee. And never, ever get money exchanged at the airport as you will be getting the worst exchange rate and the highest fees. In the U.S., State Farm allows you to take money out of overseas ATMs without charging you for the privilege. In the U.K., Nationwide and Abbey's Zero account do not charge for withdrawing money overseas or for making credit card transactions in an EU country. In much of Europe, Number26 is an online account that doesn't charge for withdrawals from ATMs anywhere in the world. The Mastercard Cash Passport offers a guaranteed (and very good) exchange rate when you load money onto the card. Think of it as the modern-day equivalent of the traveler's check. And they're free of charge; just order one from the website and choose a pick-up location (usually you can choose your airport). You can use this card both in ATMs and in shops. If you have two bank cards, leave one in your hotel (or carry it in a different pocket) so that if you lose one, you still have another means of accessing your money. Traveler's checks were once the safest and easiest way to bring money with you on vacation. The need to show ID when exchanging them for cash and the ability to cancel them if stolen meant they were a risk-free way to travel with large amounts of money. However, traveler's checks are no longer as convenient as ATMs and other modern methods of withdrawing money. Most traveler's checks can still be exchanged in Spain. But the only shops that will accept them are El Corte Ingles. If you need to exchange checks for money, you'll need to do so at a bank or a bureau de change. The lines in Spanish banks can often be quite long, and their opening hours are short. In addition, there will often be a fee for exchanging traveler's checks for cash. With ATMs being so available and easy to use, traveler's checks are usually more hassle than they're worth.